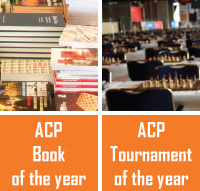 The ACP, in cooperation with the Latvian chess society, is proud to announce the ACP Cup 2013, taking place in Riga, Latvia, from September 12 to 15. Sixteen of World's best players will fight for the Cup in a spectaculair rapid chess Knock Out system. ACP - with the chess players and for the chess players!